A rare opportunity... Enjoy 90' of private lake frontage on desirable all-sports Lake Bella Vista with a large pond and your own 2.7 acre parcel. With many recent updates and improvements, the new Old Farmhouse boasts 5 bedrooms, 3+ baths, 3, 340 square feet of finished living area and a walk-out lower level. There is also a 4-stall garage with a finished and heated studio / workshop making the perfect she-shed, man-cave or kid-condo! Buyers are sure to appreciate the new, beautifully landscapedstamped concrete patio lakeside... complete with limestone steps and sandy swimming beach. Perfect for all-day entertainment, evening bonfires and sunsets! The well-manicured grounds have been professionally landscaped and offer plenty of mature trees to keep in the privacy yet offer spectacular pond and lake views. The remodeled kitchen is fantastic and now complete with new granite counter tops, stainless appliances and recessed LED lighting. The house also has a new roof and AC unit. yet offer spectacular pond and lake views. The remodeled kitchen is fantastic and now complete with new granite counter tops, stainless appliances and recessed LED lighting. The house also has a new roof and AC unit. True to its time, charm and character can be found in every room and across the property. Blue slate stone and Georgia longleaf pine flooring, a fieldstone fireplace (gas or wood burning) in the living room which has an exposed joist ceiling and south facing views over the pond. There is a large main floor master suite with private bath (premium vinyl plank flooring) and impressive walk-in cedar closet. The upper level has two bedrooms, a full bath and amazing 3-season room. The walkout lower level has a nice family room, rec room, bedroom, full bath and a bonus bunk room / flex area. The finished and enclosed front porch, upper level 3 season room and large finished studio in the garage are not included in the square footage. 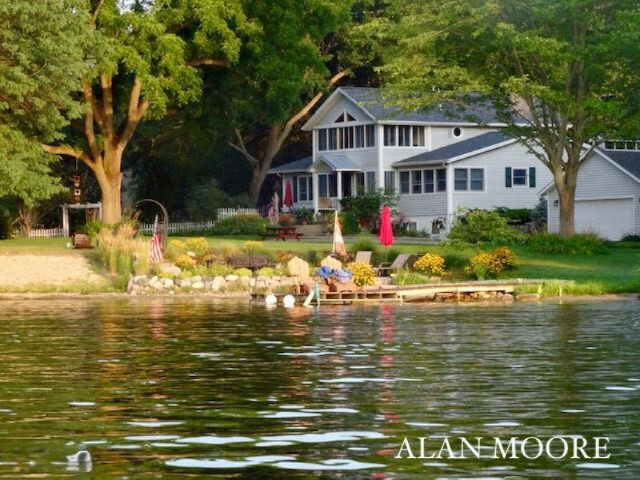 Free of any HOA's or association by-laws, yet, for a small fee has all the benefits of lake use. Association water and municipal sewer. There is also a separate well used for irrigation and maintaining the pond water level if needed. Furnace was replaced in 2007, serviced annually and sellers were told it has a good 10 years left. Always well-maintained and cared for.